The former Swiss theologian of the papal household under Pope John Paul II, Cardinal Georges Cottier, OP, thinks it's possible to accept some of Obama's approach to matters like abortion, etc. as a temporary measure because he perceives Obama as realistic. John Allen writes about the cardinal's remarks. I think the cardinal's approach is too optimistic and weak in some areas. What do you think of Cottier's and Allen's analysis? Is Cottier realistic or naive? Read Sandro Magister's insightful analysis of the Cardinal's comments. The Jesuit report that after residing more than seventy years within the papal summer Palace itself, the headquarters of the Vatican Observatory recently moved to a new location in the Papal Gardens at Castelgandolfo. The move was occasioned by increased demands for space within the Palace, and the growing needs of the Observatory. Until few weeks ago, the observatory offices were located on the top floor of Papal Palace, the Pope's summer home located in the Alban Hills, 25 kilometers southeast of Rome. 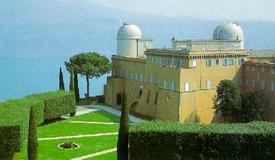 Its extensive astronomical library is scattered over four rooms on the top two floors of the Palace, while the valuable meteorite collection and laboratory, the historic vault of photographic observations made at the Observatory from 1895 to 1979, and the classroom where the biennial Vatican Observatory Summer Schools are conducted, are located on the ground floor of the Palace. Meanwhile, the living quarters of the Jesuits is divided between rooms on the second and top floors. With the prospect of half a dozen younger Jesuits joining the staff over the next five years, the issue of both residence and office space was becoming acute. "Moving the Observatory collections and libraries has been a logistical challenge," noted Father José Funes, the Argentinean Jesuit and director of the observatory. "But the new site will allow us to address a growing need for space and order." The new quarters, located in the remodelled monastery built by the Basilian monks within one of the most beautiful gardens in the Italian peninsula, should provide a far more peaceful and comfortable setting. The Vatican Observatory traces its history to the reform of the calendar by Pope Gregory XIII in 1583. It was re-organized by Pope Leo XIII in 1891, "so that everyone might see clearly that the Church and her Pastors are not opposed to true and solid science, whether human or divine, but that they embrace it, encourage it, and promote it with the fullest possible devotion." This page is a archive of entries in the Faith & Reason category from July 2009. Faith & Reason: June 2009 is the previous archive. Faith & Reason: September 2009 is the next archive.